2014 was a banner year in the land of Tableau Public. We launched Tableau Public for Mac, expanding the accessibility of the Tableau platform. We gave every viz its own home page, expanding the share-ability of our authors work.  We created the Story Points feature, providing a new way narrative way to engage with data. The community of Tableau Public authors took these new features and ran with them, making 2014 the highest trafficked year in Tableau Public history. One of the most exciting aspects of the 2014 expansion for us on the Tableau Public team to watch this past year has been the growth of new international authors. We have been emphasizing growing the Tableau Public community overseas, and we are happy, upon our Year in Review reflection, to see the impressive quality and quantity of Tableau Public vizzing currently being done internationally. This blog post will look at a couple of new international Tableau Public authors who have burst onto the scene in 2014, helping spur this global movement. Hanne Løvik published her first Tableau visualization on March 14, and boy was it a huge hit. The viz, shown below, depicts the most common baby names in the different provinces of Løvik's native Norway. It was one of the top viewed vizzes of the entire year, having garnered over 500,000 views by year end. Quite the Tableau Public debut! It definitely does not hurt that Hanne is a journalist for Norway's ABC Nyheter, one of the country's leading online newspapers. Her article on baby names is just one of many that Hanne has posted on the newspaper featuring visualizations made with tableau public. A look at her Tableau Public profile page shows her many great vizzes. This profile goes not to an individual, but to an entire team - the data journalism department of Spain's El Confidencial Newspaper. In their own words - pulled from their Tableau Public profile page - ElConfidencial.LAB exemplfies "Ideas, dataviz, data journalism, multimedia projects and narrative experiments from ElConfidencial.LAB. We belong to the leading digital native media provider in Spain and the third largest newspaper by daily unique visitors." We at Tableau Public have had the pleasure of watching El Confidencial establish itself in 2014 as one of the powerhouses of the Tableau Public data journalism community, routinely cranking out high quality vizzes that find large audiences. Since they published their first viz on July 9th, the team at ElConfidencial.LAB have produced an atonishing 145 unique vizzes! A truly amazing accomplishment. Their work is on wide ranging interests - from sports to politics to economics to education - and of a consistently high quality. The below viz is an example of their work - showing Russia's changing sovereign reserve levels. The sky is the limit in 2015 for the ElConfidencial.LAB data journalism team at El Confidencial. Ed Wanderley is a journalist for the Brazilian newspaper Diario de Pernambuco. The Diario de Pernambuco is a particularly famous newspaper in Brazil as it is both the oldest continuously published newspaper in Latin American and the oldest newspaper edited in Portugese. Ed Wanderley creates content for Diarioo de Pernambuco with Tableau Public that starkly juxtapose its modern incarnation with its historical roots. 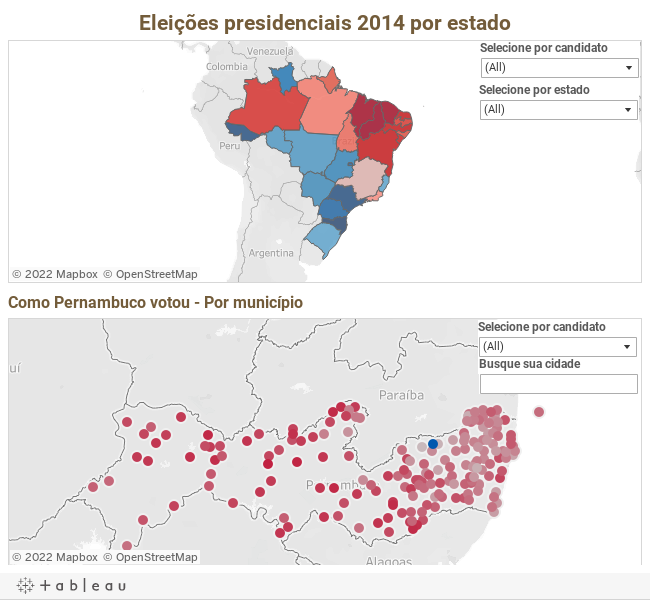 He writes articles about Brazil's political climate, and his first Tableau publication this past June (seen below) analyzes Brazil's Presidential election. A look at Ed's profile page shows how new he is to Tableau Public - he has published just three vizzes! - making his success an example for all novice Tableau Public authors. Like Hanne Løvik and Ed Wanderley, Vadim Shmygov is a journalist: he works as an infographer at the Belarusian newspaper TUT.by. Vadim is a prolific Tableau Public author, whose visualizations routinely land hundreds of thousands of views. He posted his first visualization in January, and since then has published 28 different vizzes - exemplifying both quantity of production and quality of work. Vadim writes articles in Russian on different economic issues facing the Belarusian state; his profile page is a positive primer on current day eastern-european socio-economic dilemmas. 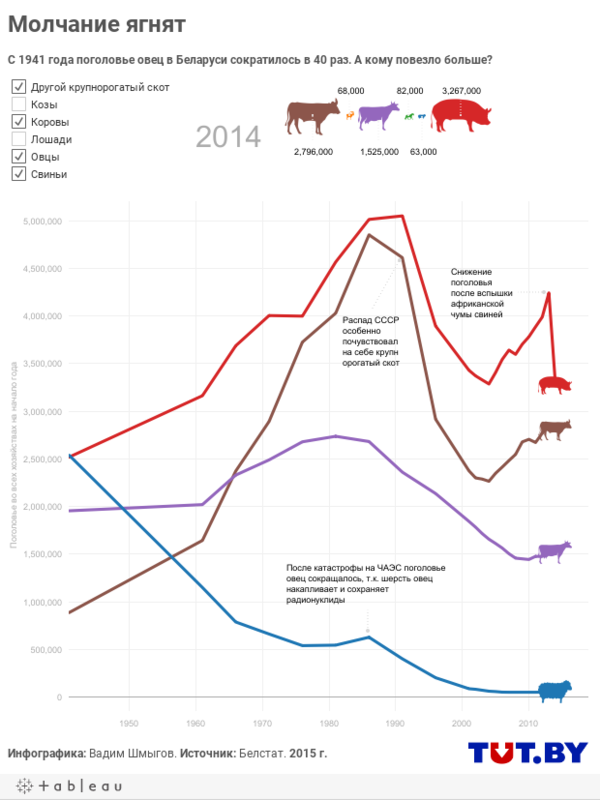 Below is an example of one such viz: an analysis of the different populations of domesticated animals in Belarus. Like for ElConfidencial.LAB above, this profile goes not to an individual, but to an organization - the Dominican Republic newspaper El Nacional. 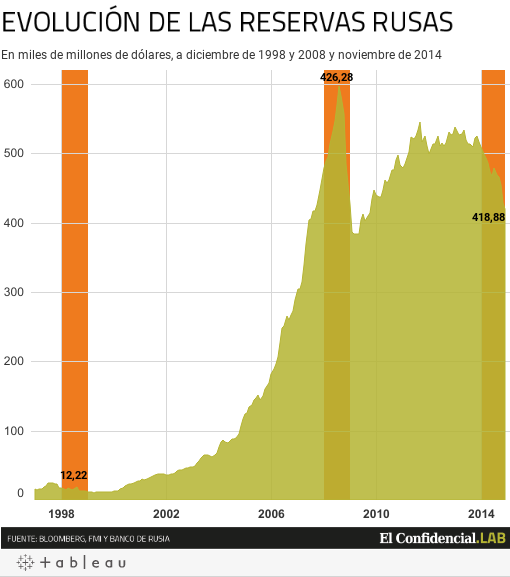 El Nacional, in 2014, is the emphatic winner of the most viewed viz of the year award, with its exchange rate tracker (seen below) having recorded over 2.8 million views since its publication in November(!). The visualization is extremely simple, showing the moving exchange rate between the Dominican peso and the U.S. dollar, yet its simplicity contributes to its utility as a daily barometer for the newspaper's readership. Remarkably, this is the only Tableau Public viz that El Nacional has published - we here on the Tableau Public team are very excited to see what they can come up with in the new year! We at Tableau Public heartily applaud all of the new authors who joined the Tableau Public community in 2014, and greatly look forward to seeing what the new year will bring!